For years I have heard about The Pioneer Woman's blog but have never really taken the time to subscribe until just recently. A friend of mine at work came in one day raving about the recipes, the writing, and the photography included on this blog and just knew it was something I would love. Well I quickly went on her blog and was hooked! Ree Drummond (aka The Pioneer Woman) makes everything from cooking Thanksgiving dinner, to herding cattle, to taking breath-taking photos of a western sunset all seem within our reach. Her writing style is like having a conversation in the kitchen with your best friend over a cocktail and the stove. She says everythign we all think, she makes the dishes we all crave, she includes all aspects of daily life into a blog that is now a staple in my daily reading! This is the first (of soon to be many) of her recipes that I have tried and it was AMAZING!!! In a medium skillet, melt 1 tablespoon butter over medium heat. Add onions and saute for 15 to 20 minutes, stirring occasionally, until very soft. Splash in wine, broth, and Worcestershire. Cook for another 5 minutes, or until liquid is cooked down. Set aside. Melt 1 tablespoon butter in a large skillet over medium heat. Throw in mushrooms and toss around for 2 minutes, just to start the cooking process. Place mushroom caps face down in a baking dish. 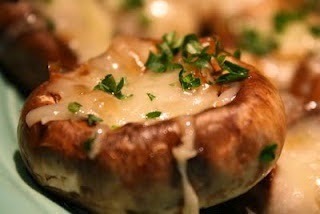 Heap cavity with sauteed mushrooms, then sprinkle Gruyere over the top. Bake at 10 minutes on 325 degrees. Turn on broiler and broil for a couple of minutes, until the top of the Gruyere starts to bubble and slightly turn brown.